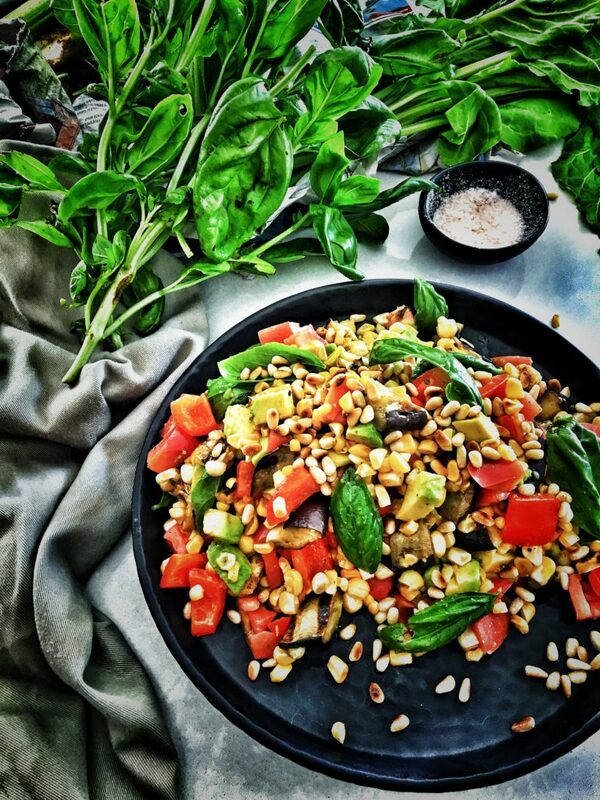 ﻿ Barbecued Veggie Salad with Basil - I AM Co.
No BBQ is complete without a side and a good salad is a must. Vegetables grilled to smoky deliciousness is the perfect compliment to any meal or just perfect on it’s own. We have an abundance of fresh corn and basil in the garden so this recipe purely came about because we hate seeing home grown goodness go to waste! Husk the corn cobs and slice the eggplant into 1cm rounds. Spread the eggplant onto a tray and sprinkle with salt. Put to the side for 10 minutes while you cut the capsicum in half and remove the core. Once the BBQ is up to heat, mop up the moisture that has accumulated on the eggplant from the salt. Place the eggplant slices, corn cobs and whole capsicum on the grill ensuring they don’t over lap. Maintain a medium heat and turn the vegetables every 5 minutes until nicely browned on all sides. The corn can be removed once you are happy with the colour however it’s important to cook the eggplant and capsicum until soft. Remove from the heat and place the charred capsicum into a bowl and cover with a plate. Cut the corn from the cob and place into a serving bowl or dish with the diced avocado, tomato, basil leaves, pine nuts, lemon, oil, salt and pepper. Dice the eggplant into bite sized pieces and add to the salad. Once the capsicum is cool enough to handle removed the charred skin by peeling it away then dice. Add to the rest of the salad ingredients and toss. Season to your liking, add some chilli if you desire and serve.